The British National Party may be imploding but they achieved 5% at the last GLA elections. At this meeting we will elect our officers and decide if we should broaden our focus to community organising. We’ll also discuss the new British Freedom Party how to tackle the English Defence League. 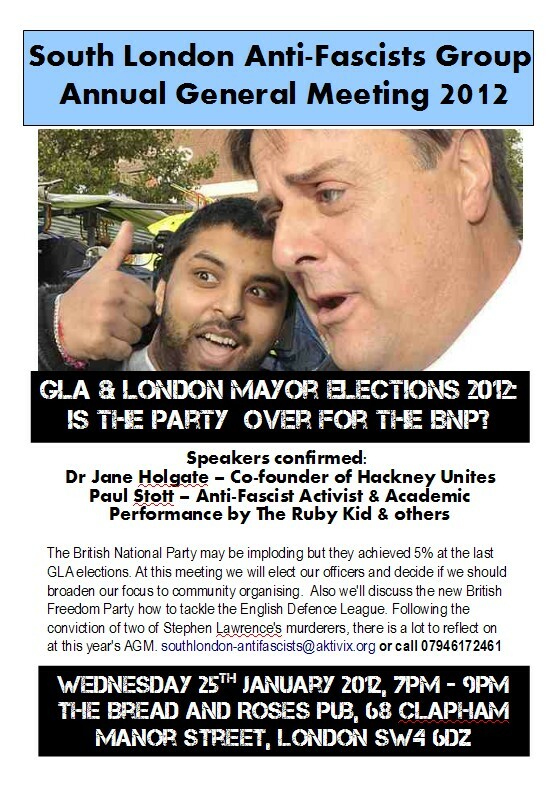 Following the conviction of two of Stephen Lawrence’s murderers, there is a lot to reflect on at this year’s AGM. Come to South London Anti-Fascists Group AGM 2012, Wed 25th January, 7pm: http://t.co/Pp8Z62Ol we got @DeanAtta @therubykid performing!